Send Grandma and Grandpa a GrandBox. The perfect gift for the holidays or just to show them how much they are loved! GrandBox is the subscription box curated specifically for Seniors and Grandparents. Each box can be personalized with family photos and a note. It's the perfect gift to bring a smile to your loved ones. I received my Grandbox and I think it is a wonderful subscription box to send to older moms and dads, grandparents anyone who is a senior. I received a crossword big book, pocket tissues, spiced mug mat that you place your coffee or tea on top and it releases a spice scent that smells so nice. Sugar free candy mints, European chocolate milk butter biscuit, a dark chocolate stick that dissolves in hot milk for a chocolaty taste !! I think this is a perfect gift idea for seniors that are hard to buy for. Always let them know you are thinking about them when they receive a monthly package in the mail I know they will adore. If they live far away and you do not get a chance to visit often send them this subscription box. 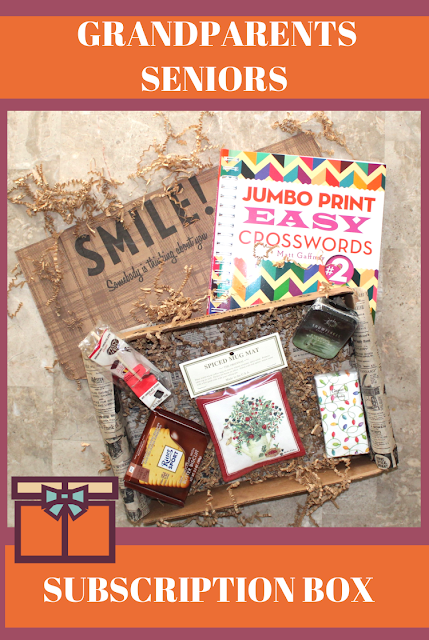 GrandBox is the perfect holiday gift for Seniors and Grandparents! Views and More was compensated and or received a product in exchange for an honest and unbiased review and all opinions are 100% my own.